Disha Productions & Solutions is a Productions unit of Shrestha Health care and Management Solution Pvt. Ltd. SHCMS Pvt. Ltd. is a company directed by very dynamic Directors keeping in mind the principal of helping them to help for the peoples facing any problem. Disha Productions & Solutions is a complete unit of professional having more than 25 years of experience in film and Television productions. Director of the Disha productions is very experienced in the field of Serials, Telefilms, Documentaries, OB Coverage & international coverage etc. & contributed in national network, writer, music director, cameraman, editor and other members are also well experienced having long time contribution in Production field. Mostly we work in the Productions made for the social cause. It doesn’t mean that we don’t make productions on other subjects. 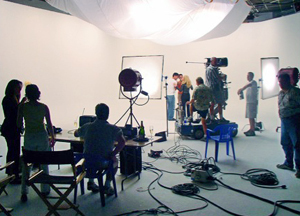 Our Production team do productions on multiple camera in the studio, apart from single camera productions. We assure for better result & quality production.